We are overjoyed with the runaway success of our new guest house retreat The Old Hospital, particularly from the craft community who have embraced us. With most weekends now fully booked until early 2020 we are now focusing on promoting our weekday bookings. And what better group to focus on who enjoy our facilities so much – our beloved crafters. And so our new ad “Get Crafty, midweek” hits Facebook for a two month trial run. 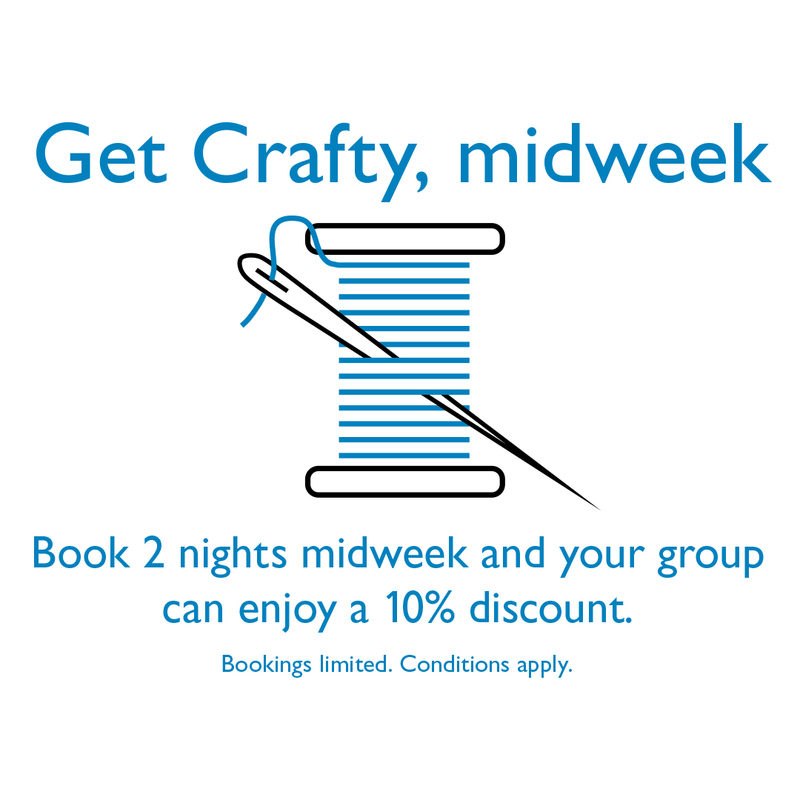 An added incentive of a 10% discount (conditions apply) we hope will entice groups of midweek quilters, embroiderers, stampers and sewers. 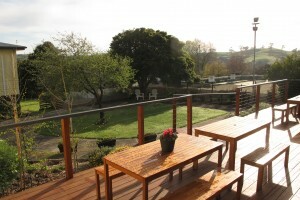 Even book groups and small corporate groups should find The Old Hospital a very convenient retreat within a 90 minute drive from Melbourne. Probus groups too are included with an article on The Old Hospital to appear in the next issue of Victorian Probian. Mid week bookings could well join weekends on our website calendar as “fully booked”, so don’t procrastinate – get crafty and book midweek! Check availability on our website calendar. We have just had our first 6 star rating at The Old Hospital! Just prior to Christmas we closed for a couple of weeks maintenance. We continued to modernise the outside colour of the building – a welcome change from a tired cream, indian red and brunswick green colour scheme. Our trusty painter worked tirelessly, dodging the often dark skies and in between the summer rain showers to transform our ugly duckling into a swan. Our guests are now eating their breakfast on our deck and are enjoying the fruits of our (or rather, our painter’s) labour. 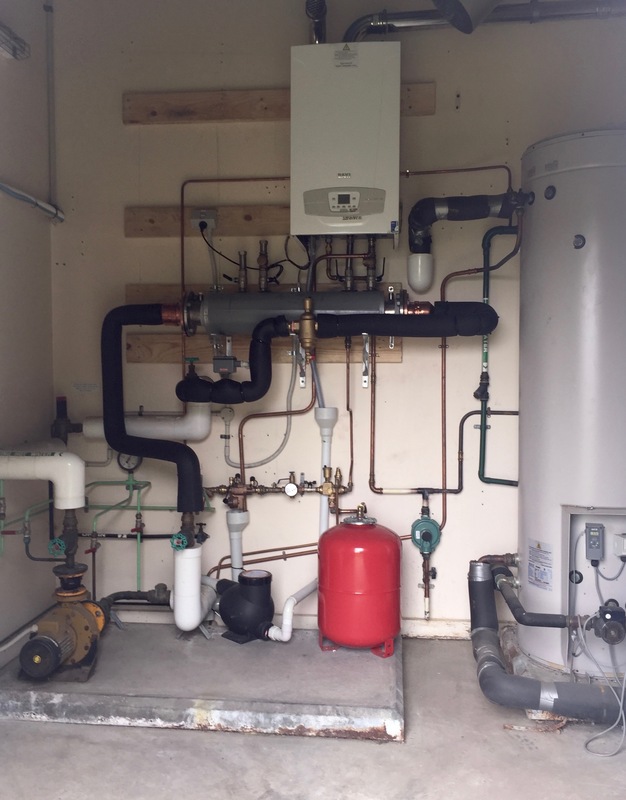 The big maintenance project was replacing our industrial sized LPG gas boiler, which powers our wonderful hydronic heating that the guests all enjoy in the colder months. The old unit was a “half star “ energy efficient, or should I say, inefficient, unit which was around 30 years old. The new boiler has a six star energy rating, and is much more user friendly, – we also hope the LPG refill truck will not be wearing out our driveway so much with his weekly visits to refill our gas bottles. The plumber has finally finished the installation and this week it has all passed the safety inspections required. Today I paid my first visit to the boiler room for a while – (Peter is far more excited to see this equipment than I am). To me it looks like a NASA launch pad! There are pipes, valves, gauges, dials, levers, cable ties, insulation, small green things, medium size black and yellow things, and even a big red thing – all too scary and intimidating for me to ever touch. Now I see why the installation was such a long process – all those bits of the puzzle have been put into place. It reminds me of the game “Mouse Trap”, when I stand at the door in wonder. I just hope the big cream rectangular thingy doesn’t come crashing down like the cage does over the little mouse eating the cheese. The place has been swept so clean that there would never be any cheese or mice inside here. I have to admit that it is a six star work of art and I am secretly excited for the winter in Loch this year – we will all be toasty warm here at The Old Hospital. After some cool, unseasonal weather and some much needed rain we see the sun re-appearing overhead. There’s a tinge of green to be seen throughout the rolling hills of South Gippsland. Even the dams look a little replenished. While we have been away on a short break our little village has been active. A new Italian cafe restaurant is close to completion and looking fantastic. A new reception venue is open and offering stunning meals and vistas over the hills near Loch. Another restaurant and shop complex which has been closed for some time has just been sold so it will be exciting to see what the new owners are doing there. This all adds to the exciting mix of shops, eateries, wineries and brewery that visitors currently enjoy. The Old Hospital has also enjoyed this transformation and new energy engulfing the village. Our guests might be staying with us to concentrate on their craft work or business retreat but are also enjoying a quick stroll down to the village for a great coffee and cake or a local wine or whisky. They also enjoy visiting the quaint little gift shops, gallery and antique shop as a divergence from their activities. It’s 2019 and we have just emerged from Stamp Camp mode here at The Old Hospital. We have just enjoyed hosting our very talented group of ladies who stamped and created their way through the weekend. Jessie, our wonderful “Stampin’ Up” demonstrator, had the ladies creating the most beautiful cards, calendars and pictures, including a beautiful 3D dragonfly framed work of art. Her trusty helper Sarah also created some beautiful paper crafts. We really enjoy seeing how all our craft groups utilise the workroom so differently, changing the layout to best suit their group’s needs. The ladies produced gorgeous works of art by day, and Sarah, a local to Loch, showed them some great places to eat and drink – to recharge their batteries so they could stamp and create away for a few more hours. Most of the group came across on the ferry from Geelong, but top kudos go to Trudy, Jill and Delores who flew down from Sydney for the Stamp Camp – a mammoth effort! We were touched by the beautiful desk calendar they made for us, as well as a lovely card signed by everyone. The card has gone straight to the “pool room”, which is actually our notice board in the hallway, adorned with cards from previous guests. The desk calendar has pride of place in our office. Thank you Sarah for making the calendar on behalf of the ladies. As I write this blog, I have just received an email from Jessie, wanting to return to us with her crafty ladies – we look forward to their return visit in September this year. The brollies go up on what is affectionately known as The Loch Deck Monster here at The Old Hospital. We welcome our first group for 2019, a group of bowlers who have travelled all the way from Mount Beauty in North East Victoria and tomorrow challenge the Loch Bowling Club on what looks to be a scorcher. At least it is just a short stroll out the back gate to the bowling club from our accommodation and they can seek respite in our lovely cool air conditioning when the mercury rises. The greens are looking in top condition thanks to the hard working, diligent locals and should set the scene for an exciting four day tournament. Although we should be supporting our guests the heart is going for the home team. Oh wow – what a year it’s been! We have just said goodbye to our last group for 2018, as we take a break over the “silly season”. We have been thrilled with the support we have received from all of our groups that have enjoyed their stay with us this year. Many have re-booked to revisit us again in 2019 – some groups are even returning to us twice! Never did we anticipate such support from such wonderful people and we thank each and every guest for staying with us here at The Old Hospital. 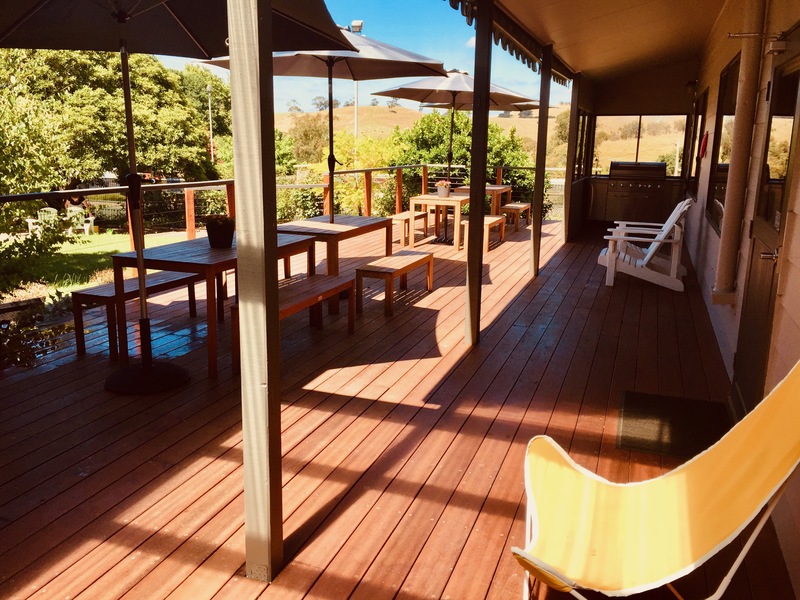 When we opened our doors for business in December 2017, we had hoped to gather about 2 or 3 bookings a month to support our “semi- retirement” phase we thought we were in. 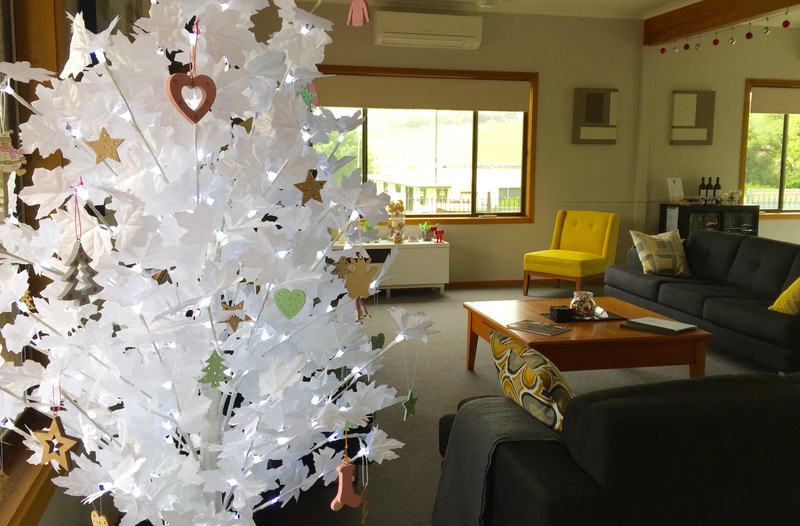 Little did we expect that we would have bookings right through the chilly Gippsland winter months (we did have visions of holidaying in our retro caravan up north for 3 months…). November was our busiest month, with 8 bookings, both mid week and weekends. At times, we had a turn around time of 36 hours, which doesn’t sound too bad, but considering just the two of us had to do the cleaning, bed stripping and making and then the return 1.5hr “linen run” to Wonthaggi and back, we only surfaced to breathe and eat at times. Although we are now closed for a few weeks, the work here does not stop. Our maintenance list consists of continuing to paint the outside of the house, installing a more energy efficient gas boiler for our central heating system and the perpetual task of gardening – a job that constantly beckons our attention. Naturally, we can’t do these things when we have guests in residence, but we have been able to install our lovely new charcoal grey shade awnings in the large lounge area, which not only provide much needed sun protection for both guests and furniture, but also allow our guests to look through them to enjoy the views of the beautiful hills that surround us. Then there is some much needed family time for us to enjoy over the Christmas and new year period. When we re-open mid January, we will pick up an even faster pace, as every weekend until the end of August (and several mid week bookings) will see guests enjoying themselves here at The Old Hospital. The recent rain means that the Loch Village gardens will look their best this Sunday November 11th, for the Loch Village Open Garden display. After the weeds have been removed, the selected gardens will open their gates for visitors to admire. There will be several different types of gardens on display around Loch from 12pm – 4pm. Simply purchase a map from Carrington’s Antiques, Victoria St Gallery or Caroline Askew Art Gallery on the day and follow the “crumbs” to your chosen garden trail. The cost of the map is $5 which includes entry to all of the gardens that will be opening. This year we have tied the theme in with Remembrance Day. Loch will host a short memorial service to remember fallen soldiers at around 10.45am at the Cenotaph, outside the old post office on the corner of Smith St & Victoria Rd. Loch Primary School children will be planting knitted poppies – one for each soldier from the Loch and surrounding area, who sacrificed their lives for us to live in peace. Extra poppies will be available for purchase to either plant or keep as a memento. At midday, selected garden gates will be thrown open for visitors to admire beyond. A couple of gardens will require a car to reach them, but are well worth the extra effort. The ladies of the Loch Garden Club have spent many months creating hand made poppies, which have been made into brooches – now on sale around the Village. Several of the ladies had never picked up a crochet hook, so many winter evenings were spent together at The Old Hospital, wine in hand, teaching and learning new poppy creation skills. Another night was spent here sewing all the pins onto the 195 poppies we made into brooches and sewing stems onto the beautiful knitted poppies to be planted. The garden club gents made sure the ladies were well fed while they sewed. It was mammoth effort by our little fledgeling club and thank you to everyone for their efforts. Last Thursday the poppies were placed for sale on mannequins in town – “Poppy” stands in Victoria Street Gallery and in Carrington’s Antiques. We were thrilled to see our creations displayed so beautifully. Please help to us support fallen soldiers families and drop into these shops to purchase a poppy for $2 when visiting Loch this week. We would love to see visitors enjoying Loch’s gardens on Sunday. The entire proceeds from the purchase of handmade poppies and garden maps are being donated to Legacy. The blossoms are out, and so are the motorbikes. Last weekend, in between showers of rain, saw “The Blessing Of The Bikes” on Phillip Island. The bikes were out, despite the soggy conditions earlier in the day, to converge on the main street of Cowes. The sight was like a bike show in itself – all makes and models to be seen and admired. It was the pre-pilgrimage to Phillip Island in the lead up to the big day this Sunday – The Australian Motorcycle Grand Prix. This weekend we hope the weather will be kind and create safe roads to “The Island”, as it is affectionately known. Early on Saturday morning on GP weekend, around 5,000 motorbikes line up along several blocks of the closed off South Gippsland Highway. Riders wait, drink coffee, chat and generally admire each others bikes. Even if you are not a motorbike enthusiast, you cannot help but be mesmerised by the sight of these shiny beasts lined up, all waiting for the one word – “Go”. A few minutes before 9am the call comes from the motorbike god (the person on the loudspeaker standing up high in the cherry picker) – “Start your engines”. The sound of 5,000 motorbikes all starting up at once is exhilarating for those standing by watching, as well as the riders and pillion passengers. Having been a pillion on the back several times for this event, it is even more exciting. At 9am they are off and revving. The cars have no hope of travelling that stretch of road from Cranbourne to Cowes for the next 45 minutes, so they usually just pull over, watch and wave to us kings and queens of the road for that moment in time. We prefer to ride towards the back of the pack for safety sake (less bikes squashed in) and to enjoy the view up the front – a sea of helmets and every shape and size of motorbike possible. I look out for the few side cars that dare to risk their life travelling inside those ancient contraptions! All along the road there are mums, dads, kids and grandparents waving as we pass, our checked flag flying proudly behind us. You do not have to be a tattooed, leather clad Mad Max type to ride a motorbike. You just have to be someone who loves the wind in their hair (well, helmet), wants to enjoy the smells and the sights of the world from a 2 wheeled perspective and feel you are closer and more connected to nature and the earth. So we look forward to hearing, then seeing the hundreds of motorbikes that will pass through Loch and we wish them all a picturesque and safe ride to the Grand Prix this weekend. We wish we could join you this year……. And the bad news is…. We have just bid farewell to yet another wonderful group who we have had the pleasure of hosting for 2 nights. 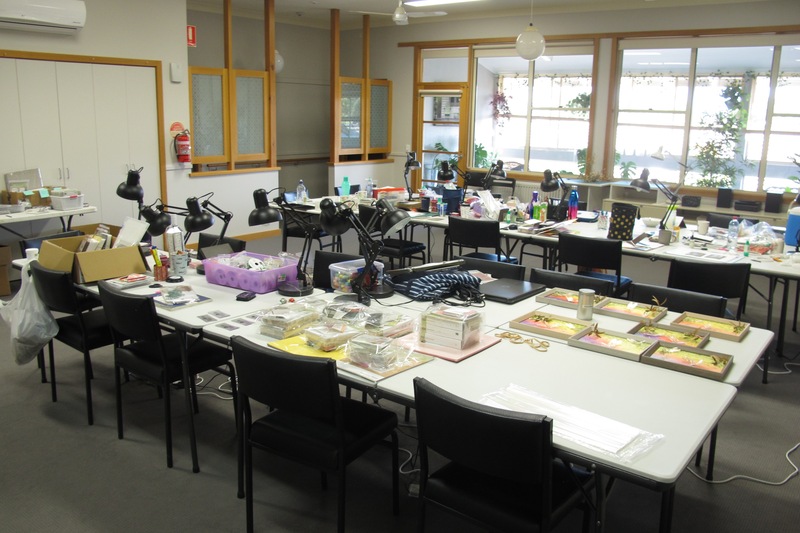 The group organiser visited us on another sewing retreat earlier this year with a different craft group she sews with. This time, she bought back a lovely group of sewing ladies from her retirement village. 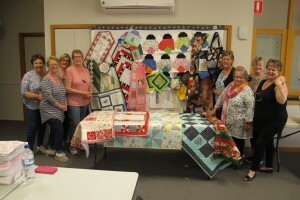 Soon after arriving they were toiling away at their sewing machines, creating quilts, bags, heat protectors and lots of other wares to sell at their annual retirement village craft market. We were their first customer, purchasing one of the fantastic microwave bowl protectors – having been sick of burning ourselves when we reheat our food. We have an advantage as on site hosts to peruse their wonderful creations. Peter and I love being invited down to the craft room for “show and tell” – an enjoyable time for a quick chat and to get first pick of their goodies for sale! There are quite a few laughs to be had as we chat about the history of The Old Hospital as well as their social and craft groups that they belong to. Most of the sewers head to nearby fabric shops for a bit of retail therapy. It seems that they all know about the local quilting and sewing shops before they arrive. Some of the groups are interested in the possibility of a “pop up” fabric shop in-house, so they can maximise their sewing time and this is something that we are looking into as a possibility for 2019 at The Old Hospital. We look forward to attending their village craft market – we are sure it will be spectacular if the items here are a glimpse of what will be on offer. As usual, we were sad to see the group leave, but….. The good news is that have decided to return to us next year. They decided that 2 nights was not enough, so have booked a 3rd night to maximise their creativity. Springing into action in Loch Village. It’s a beautiful spring morning in our pretty little village of Loch in South Gippsland. As the morning sun reflects off the dew from the previous chilly night on our deck at The Old Hospital, you can hear the kookaburras and magpies stir to life. Our visiting guests from the weekend – a group of lovely craft ladies that had returned to us – were very creative and produced some beautiful fabric purses and felting work amongst other things. One lady was enjoying her very first craft weekend away with a group and said she had thoroughly enjoyed herself and The Old Hospital “had absolutely everything she needed for her weekend”. Now that they have left for their respective homes it is down to business – cleaning, vacuuming, stripping and making beds. As well as our work at The Old Hospital, there is also the community work to get involved in. Sunday morning witnessed a group of dedicated volunteers assemble on the outskirts of Loch to clean out and prepare ground for a tree plating to beautify one of the entrances into our village. To the sound of tractors and chainsaws, gnarly willows were cleared and pretty soon some fresh plantings will appear. We are very fortunate to have an active and dedicated community. The village also has recently formed a Social Gardener’s Group. 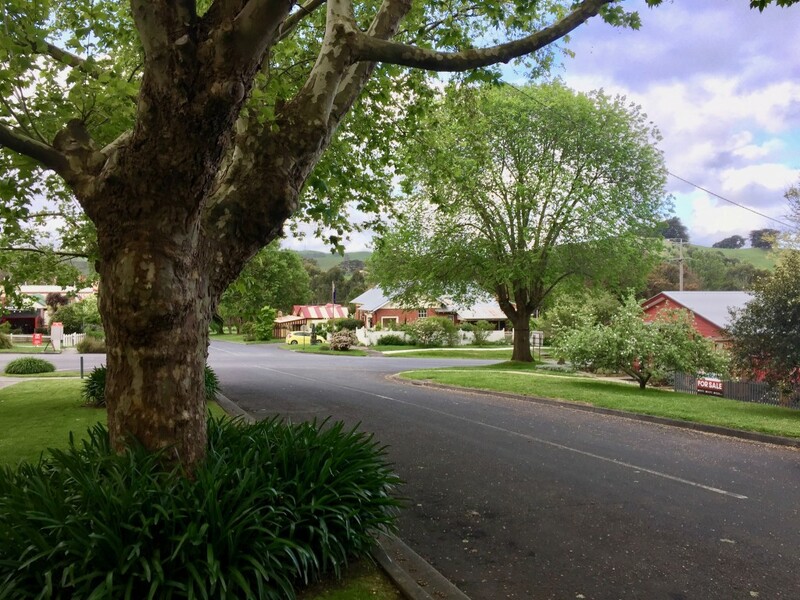 While the focus is primarily social, they organised a Trivia Night to raise funds to plant a new garden at the Loch Community Hall. The group had enormous support from the local community and the garden is now growing. Their next event is the Loch Village Open Garden Day on November 11th, which will tie in with Remembrance Day, and the gardens will open after a short ceremony at the Cenotaph at 11am. 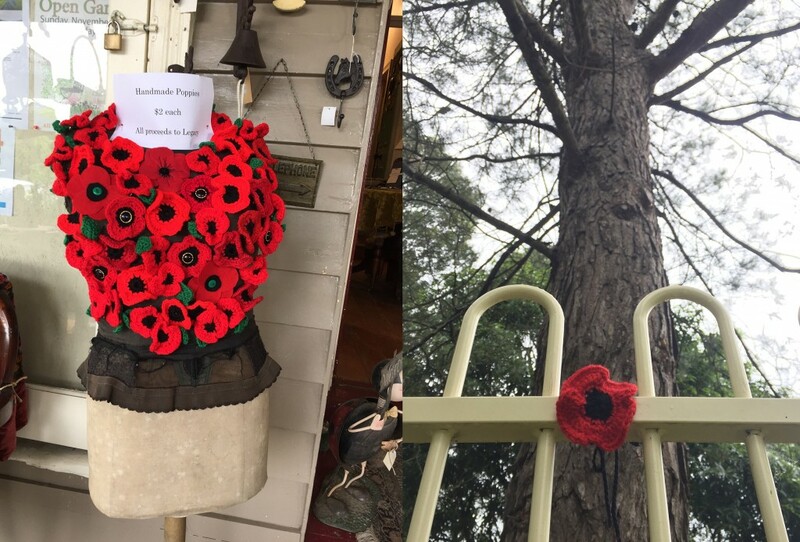 The group have crocheted, knitted and sewn poppies to decorate the village and to sell in the lead up to the day, with proceeds going to Legacy. Around eight gardens will be on display and maps will be available to purchase for $5, which will cover entry to all gardens. There will also be some small plants for sale and maybe even a homemade cake or two. Dig under the surface of our village and you will also find the very active Loch Country Women’s Association, about to host it’s Peruvian day for the Australian CWA’s 90th birthday, with food, crafts and even a guest speaker showcasing a recent motorcycle journey through Peru. Funds go to helping local families and farmers who are doing it a little tougher than the rest of us. The Masonic Lodge are another active community group, with a long history in the town. They are a great support base for men who need to share their stories. The Lion’s club run the Loch Community Market and barbecue delicious sausages and hamburgers on the 2nd Sunday of the month. These are just a few groups that come to mind, that make up a wonderful community of people who are always there to support each other in times of need, or to just share a laugh and a chat with.